This updated E3 Arms complete lower receiver features an improved ergonomic grip with trap door and a tactical buttstock with a quick detach sling swivel attachment port... ( Sling Swivel Not Included ) Q.D Sling Swivel is Shown in Images For Informational Purposes Only - Based off a Billet Aluminum design where all others are of a less superior Forged design, ours are reinforced in all areas of concern and the strongest available on the market bar none!-Has an internal pocket radius in the GEN 2 design toward the rear of trigger which eliminated the back strap from breaking. Due to extremely high demand on this item the manufacturer has temporarily ran out polymer buffer tubes. In order to continue to supply our customers with this great product we have received a small shipment of lowers with premium metal buffer tubes. The metal tubes equipped with a drain hole and a added value of $40+. If you would like the metal tube click the "Metal Tube" option below for an additional fee. If you would like the polymer click the "Polymer Tube" option. THIS IS THE HOTTEST AR-15 BUILD PRODUCT ON THE MARKET HAS GOTTEN AN UPDATE! 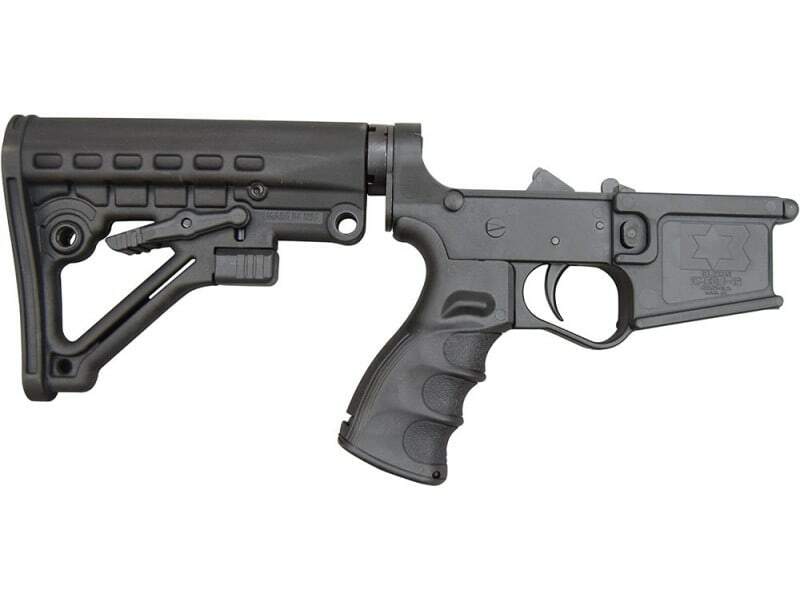 WE HAVE TRIED THEM AND WE LOVE THEM... E3 Arms Firearms Complete Light Weight Polymer Lower With 6 Position Collapsible Stock. Semi-Automatic. This Complete AR15 Lower is engineered using fiber reinforced composite material, more resilient to damage than aluminum. These lower receivers have been extensively tested and proven in both semi-auto and full automatic configurations. Since the creation of the GEN 2 fire control, we have not had one hammer come back broken and they have seen from reports back up to 50,000 - 70,000 documented rounds! Based off a Billet Aluminum design where all others are of a less superior Forged design, ours are reinforced in all areas of concern and the strongest available on the market bar none! They are impervious to gasoline, acid, acetone, kerosene, and will not break after being dunked in liquid nitrogen and thrown onto a concrete floor , unlike aluminum which would shatter! These can handle up to 500 degrees and in the summer time, they are not hot to touch like aluminum receivers! They are lighter than aluminum and can be run over at the mag-well where aluminum will be crushed and rendered useless! If you scratch ours they retain color and also a little WD-40 and some green scratch pad removes the scratch. Our fire controls require no lubrication whatsoever. HK, FN, Bushmaster and Glock all used polymers to bring their products into the new millennium. This AR-15 Lower sets the standard for the next generation of AR shooting enthusiasts!! The lower has a 6 position buffer tube. It also has a high-velocity composite trigger mechanism with a crisp break at around 4.5 pounds and no perceived creep. These lowers are the best value bar none on the market today. We have tried these lowers on a wide range of uppers and they perform great. Weighs approximately ½ that of Forged Aluminum Receiver Durability surpasses forged aluminum receiver Impervious to chemicals including acids, fuels and salts. Reduced wear properties and no color loss from wear Engineered for acceptance of Mil-Spec parts (less winter trigger). Complete with buttstock and lower parts kit. THE E3 ARMS FIREARMS LOWER COMES WITH A LIMITED LIFETIME WARRANTY!!! These things are tough as nails with no wedging or spacing and perform flawlessly. They are getting great reviews throughout the industry and are starting to gain ground in the Police and Military market... Get yours today. Personal Note - As an old school traditionalist I have an aversion to anything that is basically all polymer. Especially a hammer that strikes a pin over and over, but we have clients who have shot literally thousands of rounds through these. 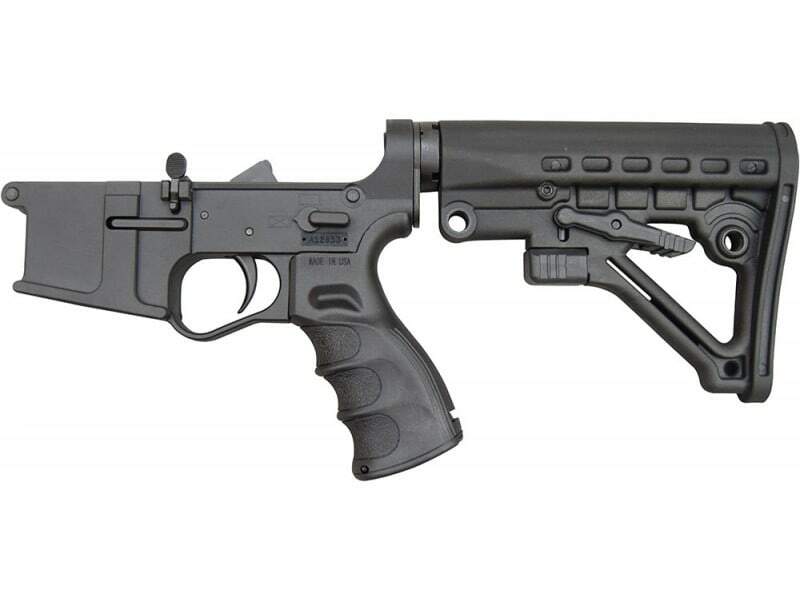 *Note E3 Arms Lowers are designed to function with all rifle length platforms. However, these lowers will not work properly and should not be used in a pistol configuration.